Winter seems to be the time of year that many of us go into social hibernation and avoid leaving the house. Especially here in Perth, where we’re so spoilt by good weather, that even a hint of rain or a chill makes it a city of shut-ins. But Winter brings us the opportunity to engage in different activities and interact with family and friends in different ways. A very inviting social scene this time of year is the humble (or not-so-humble) dinner party. Think a cozy warm setting, a select group of friends, intimate conversations, warming wines, and rich hearty food. 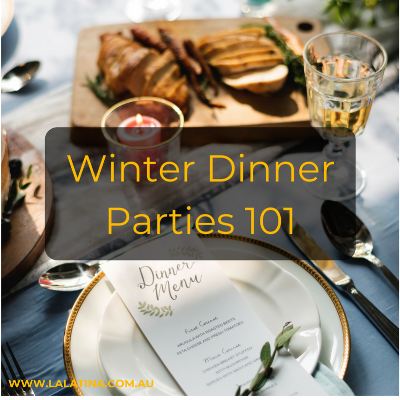 Here are some top tips for how to create a perfect Winter gathering. Keep it cozy, by keeping it to an intimate number of friends around a dining table. Or if opting for a larger gathering, go for an outdoor alfresco area protected by the elements. Those outdoor heaters are ideal for encouraging guests to be comfortable outside and can be hired. Invite warmth by including an element of fire in your décor. You may need to crank up the fireplace, light candles of different shapes and sizes, or if you have the space and safety requirements, gather guests around a bonfire, perfect for roasting marshmallows and inspiring late night chats. Break the Ice. If you are inviting guests who don’t know each other very well, break the ice by placing little conversation starters at each person’s place setting. Create a signature winter cocktail or a red wine sangria for guests as they arrive to break the ice. Or warm things up with the German’s answer to sangria in Winter – Gluhwein, German mulled wine, combined with spices, red wine, citrus, sugar and served warm. Offer a few canapes or tapas to begin with so that guests aren’t hungry as they arrive and mingle. Alternatively, you could prepare a decadent grazing board of antipasto, cheeses, dips and crackers. Continue the theme of warmth in your menu serving dishes that exemplify the use of fire, such as a fondue, a roast leg of lamb on a spit, a flambe dish (if you’re game) or my obvious personal favourite, paella, where guest can enjoy the live cooking show around the warm flames of the paella burner. Warm and Rich. Winter food is synonymous with comfort food, so make sure your menu is rich, decadent, hearty, filling and warm. Favourites include slow roasted pork, chicken pot pies, beef bourguignon, lamb shanks, butter mashed potatoes, garlicky roasted winter vegetables, brussel sprouts with prosciutto, chocolate ganache tarte with fresh cream, apple crumble, and banana flambe. Share the load, if you like, and allow your guests to participate. You can create a shared menu where everyone offers to cook and bring a particular course, such as entrees, sides or dessert, while you focus on the main course. Outsource! And if all this has served as inspiration, but you rather someone else do the work while you sit back and enjoy your evening, La Latina is offering a winter catering in Perth special of our decadent Spanish antipasto grazing board, paella of your choice and churros con chocolate for dessert. For more details call Cristina on 0413 370 907.